character is your destiny but a slight change in circumstances will not change your future. But a bad habit or new way of life can change your life. Palmistry is not a superstitious or mystical or mysterious thing. The lines on the palm are simply a reflection of the brain. Our minds are not static and therefore nor is our future. From studying the palm, the palmist can make certain deductions of the personality, temperament and character of the person whose hands are being read. The beauty of palmistry is that the brain is always is in the know before the body, or our conscious mind. The lines reflect the subconscious as well. We may deny certain things in our behaviour or changes in our body, but the subconscious mind always knows and therefore the palm reveals thoughts and events much earlier, well in time for the person to rectify the situation. Let me explain this a little. Almost every one of us gets "feelings" about certain happenings, and some of these feelings turn out to be wrong. This is because our conscious mind cannot always make sense of what our subconscious is feeling and mixes up genuine intuition (which comes from our subconscious) with subjective and wishful thinking. Palmistry helps here. If we remove the cause of a problem, the line showing the problem disappears. A line can disappear or appear even in one day, though usually, it can take a few weeks or months. If you observe the lines on your hand diligently for months, you will see certain changes. There have been instances where even the shape of the hand and fingers have changed. This usually denotes a significant change in the character of the person due to circumstances. Note: Palmistry is based on scientific principles, but hand reading is an art. This is because the same line or sign on two different hands means two different things. More importantly, no one sign or line can be important enough to tell you about the person's character or future. Each line or sign has to be read in combination with other signs, always and without exception. Related Reading: Can Palmistry predict future events? or How to decipher signs and lines on a hand or How hard is it to change the future? Hi Sudhir. Yeah, thats one of the things I want to do. Hi and welcome to my blog Viv. I agree with you there! Palmistry is absolutely fascinating and it always pains me when someone rejects it out of hand. And lines change just as we change. The more you change, the more the lines change. The hand is you and it is there to tell you everything about yourself. What matters is the interpretation. With all due respect to your vast experience of 30 years studying this science, you have not mentioned actually how or why these lines form except saying that they're related to the brain(isn't our whole body related to it? Then why can't you read, say, my tongue and offer me your insights?). Exactly what factors lead to changing of these lines? Have you ever gone beyond the pretext of the "brain effect"? Under what circumstances, do these lines change? Exactly what is the dark pigment of cells which makes these lines stand out? I have an explaination. The lines appeared where they are just so that they could help the early man achieve the grip he needed to hold the weapons during hunting or when he needed to hold something. These lines increased the friction and helped in the same. The lines serve no other purpose except maybe provide employment to palmists!!! I make my own future and not line can tell what is it going to be. Take this challenge and tell your humble readers things that you expect these great men or women would do or would happen with them by your palm sciences. What you've written is very general stuff which everybody knows about them. Defend your career/industry with this challenge!! Aniruddh, I am happy to take up your challenge, as you have been very polite. Well, firstly the maximum nerves are in the hand and this has some relation to the lines forming on the palm. However if I knew exactly WHY it would be very easy to answer the question. What I do know is how palmistry evolved. Early palmists saw that some signs on the hand led to certain readings and when they saw these signs repeatedly on hands it was taken to be a sign which meant something. Palmistry was developed thousands of years ago by the ancients because of actual cases, and it has taken thousands of years for it to develop to what it is today. Also, the future is in your own control. I think that is very clear from my writings on this website. Lines can change and so can the shape of one's hand and fingers. As you change the lines change. Any palmist which tells you of a fixed future is a fraud. Unfortunately there are more frauds in this profession than genuine palmists and that is why palmistry has got a bad name. As mentioned in one of my articles on this blog, signs have to be read in combination with each other. Just like a doctor takes several things into consideration before making a diagnosis. It is very difficult and takes years of practice. As to why the lines should show some future trends it is very simple. Our subconscious mind knows many things which are conscious mind does not want to acknowledge or admit. That is reflected on the hand. If a certain person has some bad habit he will know that it is going to lead to some disaster, although he may not want to think of it. His subconscious mind will know and it will show on this hand. If this habit changes, his lines will change. You say I have written some general stuff. Do you have any idea how difficult it is to read the hand of someone whose lines one can hardly see from public photographs? I spend hours and hours on each hand so that no mistake is made. I have read hands of people who I barely know. However it is not possible for me to give exactly how I reached the conclusions as I am writing a book. I cannot give away my knowledge for free. I have worked very hard for it. If you doubt me you can send your hand for a reading and I can tell you about yourself. And if you don't want to know about future trends I won't mention them. The price is lower for just a character reading and I can give you a discount. I cannot do this for free because it takes several hours to read one hand, at least for me. I cannot take a hand and read it in a few minutes as many frauds do. I need photographs which I study over a certain length of time. It is also quite exhausting as it means going into the mind of the person. I take this work very seriously Anirudh and believe in it implicitly. That is because I have seen it borne out on the hands of people I know personally, over many years. Whether it is childhood and college friends or relatives. Anyway, if you have any more questions, you are welcome to ask. CAN U EXPLAIN HOW LINES ARE FORMED?THEIR STARTING POINT SUCH AS HEART LINE START FROM MOUNT OF JUPITER OR MURCURY? WHY HEAD LINE GOES TO MARS? 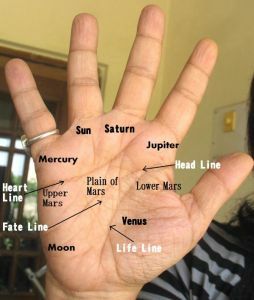 STARTING POINT OF LINE IS THICK OR THIN?CAN FATE LINE START FROM MOUNT OF SANI?HOW LIFE CURRENT ENTERS IN BODY?LIFE LINE STARTS FROM JUPITER+MARS OR FROM WRIST TO JUPITER+MARS?HOW ABOUT INDIAN PALMISTRY? Anonymous, I can explain why but I believe in the life force. As for the line being thick or thin, it has a meaning. Fate Line starts from the bottom and ends on the mount of saturn, or should end there. A lot of people talk of eastern palmistry, indian palmistry and western palmistry. I don't care for these labels. I just do the palmistry I believe in. NOT MENTIONED STARTING POINT OF LINES.NOR WHY THE MOUNTS ARE THEIR IN THAT CERTAIN POSITION. WHEN WE KNOW HOW LINES ARE FORMED THEN ONLY WE CAN THINK FOR CHANGE IN LINES.ORIGION OF PLAMISTRY IS IN INDIA.OUR GREAT RISHI FOUND IT IN TRANCE.THEN ONLY PLAMISTRY SPREADS TO ALL WORLD.AND TODAY ONLY COMMERCIAL PALMISTRY IS PRESENT.WHICH IS NOTHING TO DO WITH RELIGION,SOUL,ATMA.PURPOSE TO COME TO THIS WORLD,WHY WE ARE WE & HAVE SPECIFIC HANDS & LINES,MOUNTS WE DONOT CONSIDER ALL OF THIS. This post does not explain the whole of palmistry. Also, the mounts are in that position because of the nature of the person. I am not a hundred percent sure HOW lines are formed. I will be exploring this in my book. But to me it is one of the mysteries of the world. Not all mysteries have been solved. Hello Nita, I read you article on Palmistry. You mentioned that your future can not be told with certainity. How come that guy Chiro the famous palmist did for many people. How come so many people mentioned that he predicted with 100% accuracy. He also said that to read a females hand it should be her left hand and for males it should be right. I really want to get my palm read one day, but it is very difficult to find someone who is a expert. When it comes to future trends, what can you say when you read someones hand? Anonymous, The future told on the basis of palmistry will come true if the person does not make any changes in his/her life. We have to see how many people are willing to change. Very few people even acknowledge that they need to change. These people believe in destiny and well, in their case their destiny will be fulfilled. There are some famous people whose hands I have analysed who have changed their destiny. It is not easy because it means developing qualities which have not been inherited. I do not follow Cheiro. I also believe he had strong intuition and not all that he predicted was from the study of palmistry. It is a good idea to get your palm read, and choosing a palmist is not easy. It is far more difficult than choosing a doctor as quite a few palmists are not experts. You have to be very careful when you choose a palmist. The future trends that can be seen from the hand are relationships, obstacles in career, bad periods, good periods, career satisfaction, whether ambitions will be achieved, whether the person will be content with the amount of money he has and so on. Major events of the past can also be seen. And once armed with your character analysis it is possible for you to make the necessary changes to improve your future. You can change your future if you know how. Hi neeta... must say your blog is really an eye-opener.... i have something really specific in my mind that i need to ask you.. that is can palmistry exactly tell the future career prospects and whether one is pursuing the right career path... i will be glad if u can answer. Anonymous, ofcourse palmistry can tell whether one is pursuing the right career path. In fact palmistry does that very accurately indeed. And yes future career prospects can be told but the person can make changes in his life and the future can change. It depends on whether he makes a serious change either in his life or personality. Anonymous, a successful politician is not necessary a good politician. There are people who have inherited their political career. These people will be successful but their hand will be different from someone who made it on his/her own. Also, some political systems are such (for eg. India) where corrupt and inept people can rise to the top in politics. A clean and honest person may not make it although he may have other skills. Therefore it is not possible to talk about traits that successful politicians have. However one can talk about certain temperaments that are suited to politics. Take Rajiv Gandhi. He was temperamentally unsuited to politics as he was an inherently shy person. There are greater chances of success when one is temperamentally suited to a profession as one is happy doing it. Rajiv Gandhi would never have made it if he was not a Gandhi. So the right career path is one which is suited to one's personality. Whether one succeeds or not depends on one's intelligence, will power etc, traits which are needed for success in general. you said that the future cannot be told correctly and can change if one needs. But u know everyone is trying to change their lifestyle when it needs. But it is hard to change, because we all have our own character and it is fixed. In some cases great changes are happening, but it is not by ourselves. Every thing is already fixed. But no one can tell 100% accurately.whether it is palmistry or astrology everything has its own limitations. no one tell when he will die. So just keep it to god do your duty. see what is happening. ofcourse it is hard to change. It requires will power, especially when the thing one is trying to change is major. Some people never change and they have a fixed destiny. They expect it and they get it. thank you !i had a good time... now i know what to say during my speech! My palm was read 12 years ago and it was right on. I was just married for 6 months. The reader said I would have 2 kids, a boy and then a girl. She said that the girl would be with a different man as he was my soulmate, NOT my current husband. Well, it upset me and I chose to ignore it. 12 years later, I have a boy from my first husband and a 1 year old girl from my new husband. We weren't wanting anymore kids as he has 4 boys from a previous marriage and was using birth control. Here she is though. Today, my sons speech therapist offered to do a reading. She's in her 50's and have been doing them her entire life. Well, my life line is kind of short and branches off in thin lines. My left hand also has a short life line. So she tells me I will die in my 50's or early 60's of a serious disease. I'm 38!!! That's not many years ahead. I don't drink or smoke. I'm not over weight. Don't eat unhealthy. How do I change this?? I'm so worried. First of all let me assure you that it is impossible for any handreader to predict how many children a person will have leave alone the gender of the child! It's amazing how gullible people fall for this. It was just a guess as many people do have a boy and a girl. When it comes to your second marriage, well, long term relationships can be seen with greater accuracy (although not in all hands) and when the handreader saw another relationship, he probably used his intuition. Let me repeat, the number of children one has or their gender cannot be told from the hand. Any handreader who says he can do it is a fraud. When it comes life lines I have seen many hands where the person lives well past beyond the life line and also cases where the person has passed away and the life line continues well past that point. The life line does NOT reveal the length of life. If any handreader has said this to you then she is a fraud. Keep away from such people who are a shame to the handreading community. It is very difficult to see death from the hand and dangers to one's life are often seen on the heart or head lines or the mercury line and ofcourse on the life line. But not actual death. Sometimes a palmist who says these things plants a seed in the client's mind and it can happen that this affects the person and creates ill-health. Our mind plays an important part in it. You said how can I change the time of death? Well, as I said death cannot be predicted with accuracy from the hand. It can NEVER be foretold by looking at the length of the life line. However dangers to one's health can be seen and the causes seen in the other lines. Therefore it becomes fairly simple to fix it. So take my advise, continue to lead a healthy and safe life and check for any genetic diseases. Have regular health check-ups. I would advise this to anyone even without seeing his or her palm. It is the way to be healthy and safe. all i can say is u r doing a grt job. keep it up. keep it up . cheers. my marriage line ends in a fork, alot of people say that means unhappy marraige or divorce. it has bugged me all my life and I'm not sure what i can do to change it..
For one thing, the "marriage" lines are the most unreliable indicators of relationships on the hand so whatever anyone told you, it's not true. These lines can be used as confirmatory signs only. Relationships are shown by influence lines on the mount of venus and also by lines joining the fate line from the moon mount. Not everyone's hands show relationships marked this way but that does not mean that they will not have the relationships. A fork on the marriage line (taking the worst possible meaning) means that the person you marry or have a long-term relationship with will be different temperamentally. Deep vertical bars cutting the marriage line are more worrying than a simple fork. And while these deep vertical bars which overshadow the marriage lines do show disturbances in the relationship, they do not necessarily mean divorce or separation because this sign has to be confirmed elsewhere in the hand. As I said these "marriage" lines are not reliable indicators. And then remember that legal separation, legal divorce, marriage ceremonies etc are not shown on the hand at all. These are man-made and are not shown on the hand. Relationships can be shown, good, bad, or indifferent. What this means is that "fate" does not depend on your lines. It depends on YOU. Choose a partner wisely, become aware of your own faults, do not have high expectations, be loyal to your partner, and adjust in the marriage, and you are bound to have a happy married life. It would be interesting to see whether his hand shows the fork too. At times the fork is shown only one hand, not the other's. Yes. Both of us has one hand with a fork. The other doesn't. Does that say something? It depends on which hand. The right active hand (the one with which you write) or the left passive. If it is on the passive, forget about it. I have assumed so far that the fork you talk about is on the active hand. The reason I asked is that at times this feeling of a "difference" of temperament/ideas or values is a feeling that only one party feels. If it is on both the hands, it means that both feel it. That's all it means. As I said before it does not mean divorce or separation, whether it on one partner's hand or both. I went to a palm reader on a whim to see what it was like. She said I had an unusual hand (she looked at my dominant hand) and frankly seemed spooked when she looked at it. Since my father died young, I had the feeling that she was witholding information. I went to the Internet and saw that the asterisk that I had at the end of the line going to my middle finger supposedly predicts a tragic death. I stopped looking up stuff after seeing this--especially since I have several other asterisks. I also have an asterisk directly under each of my other three fingers, but not the thumb. Moreover, there is an asterisk that is on a line that goes to my ring finger as well as an asterisk that is vertically below my ring finger and horizontally lined up with the base of my thumb. I also have another asterisk between what the palmist told me was my heart and my headline that initiates from a line that curves and goes directly to my ring finger (this is the line that has that other asterisk on it). There is also a small circle right by the asterisk directly under my ring finger. The palmist was interested in this circle, but didn't say much about it, but her body language, again, was concerning. Is there a possibility from your experience that all of this stuff means early death or can it be something else? I went to a palmist on a whim and she was very vague. She looked almost shocked when she looked at my palm (on my dominant hand). She mentioned an asterisk on the line going to my middle finger and a small circle just under my ring finger and said they were unusual. I went to the Internet and saw that an asterisk at the end of the line going to the middle finger meant a violent death. At that point I stopped looking stuff up! Even more concerning is the fact that i have several more of these asterisks. I have one directly under my ring and index fingers. I have one just to the side of the base of my thumb. I also have one that starts with an asterisk below the pinky (between the head and heart lines) and curves to the ring finger ( with a second asterisk on this line just under the ring finger). Finally, I have an asterisk that is way below my ring finger that is horizontally lined up with the base of the thumb. My father died young. Is my hand predicting the same fate for me? and this will explain to you whether it is possible to predict future events. As you will realise after reading the post, it is quite impossible to predict anything with certainty. To come to the conclusion that you will have a tragic end to your life because your father did is not at all logical. If such an event is by some chance marked on your hand, you can change it. I am not sure what kind of trauma you suffered when your father's death, but I suggest you see a counselor to sort out any issues with the past. At times a tragic event in one's past can interfere with a person's will to live and can create anxieties which can in turn lead to tragedy. So please get it out of your mind that anything is "fated." That is the first thing. If you wish you can send me your hand photo. I will not charge you, just tell you if I see anything significant. My great granny was a well known palmist, I would love to follow in her footsteps but beyond the 3 main lines I struggle to learn. Every palm I see is so different, my mind goes blank and I mumble vague things. Is there any way I can get my act together? Dear Anonymous. Choose a profession where your mind does not go blank. It would be interesting for you to adopt a theory as to where the lines in the palm come from. Once there is more certainty there, then this blog about the ability to change becomes somewhat more tangible. Dear Anonymous, yes, people assume the lines to be something mysterious and mystical and want to know where they come from. This questions is asked very often. Unfortunately Cheiro (who I think is the most read author on palmistry) propagated some theory about some "force" which entered the tips of the fingers. That is not true, but has given rise to the theory of some mysterious force creating the lines. The truth is that there is no mystery at all. The lines are a reflection of our brain. They are formed by our brain. The same way our other body parts are formed. The lines on the hand are a part of our body. Now why they are formed, why they are there is another matter. But if we look at it from a non-mystical point of view, the answer becomes clear. The lines on the hand serve a purpose. They are a guide to us humans. Just like our fingers and toes serve a purpose so do the lines. Only highly evolved creatures like humans have these lines, and we are the only ones who have a highly advanced brain. So you see, the brain is the doer of these lines. The human brain. I have right handed girl. I have deep marraige line on my right hand. And it has a fork at the end. And one branch of fork is touching my heart line. I have been googling it which really disappoimted me :( i am very worried. My left hand have three relationship lines. The one nearer to heart is thin next line is thin too. The third line us thick and deep having no fork. But there is another small line right abo e the third line which is very thin. Please help me with it. Glitter, there is no such thing as a "marriage" line. If you are talking about the horizontal lines at the base of the little finger, they can be used for confirmation only. You can more accurately about relationships from the influence lines on the Mount of Venus and also influence lines joining the fate line. At times though difficulties in relationships can be confirmed from these lines. However, these lines can change. I know a person who had a a fraying line there, and today, after a decade, there is no evidence of it. The lines change as you change. I think if you have some apprehensions about your relationships not succeeding, be careful when you choose your partner, and also see whether you have the right attitudes going into a relationship. The lines are a reflection of you, not the other way round. So stop worrying, and read all you can about how to have happy relationships! Talk to people who have happy relationships. Thanks for the information. I a question about my lifestyle. It is short on my active hand. Does it means I have a short life? Mrunal, please do not worry. A short lifeline even on the active hand does not mean a short life. The Fate line on my right hand ends somewhere after crossing my head line. It ends approximately between the head line and heart line. I looked it up online and it says that because of this I might face obstructions in my career after the age of 35 due to some wrong decisions or due to me being judgemental. What to do? Should I be worried? I am currently 22 years old. No, you should not worry. Also self diagnosis not right. The hand has to be read in a holistic manner. What is certain is that lack of a fate line does not show obstructions in the career. I suggest you stop worrying because worrying and thinking can create bad situations. Also remember that the future is not fixed. We make it as we go along. Fate lines grow and fade away, depending on our thoughts and actions. During her childhood in Palani, K.R.Vijaya the actress met a palmist who viewed her palm and immediately told her that one day she will be at the top of stardom.She told the palmist that she didn't believe that. However, the palmist's prophecy came true in her life. K.R. Vijaya spent her childhood in Palani at a time poverty was rampant, and her family too could hardly make both ends meet. In my own case my palm print is having a mystic cross with a fate line joining it leading to Sun mount with a triangle at the heart line located sun line and an attendant long influence line joining the sun line.My palm print is comparable with that of Cheiro .I have submitted many papers in astrogenetics and space science related astrogenetic palm print analysis.Though i retired as Thermal engineer ,contributed many papers in Space science. Palmistry was really true in my own case. i have a small doubt about my marriage line, its like, from the both hands starting with a fork. (two lines joining to one) then going straight strongly with no defects. both hands this appear. i want to know what will occur this formation. thanks a lot if so. and another interesting thing is my right hand has two fate lines, one line merge at the middle of the other, first one starting from mount of moon. in my seen, i can see there starting position having a Fish kind of formation, i thought so. and the second fate line starting from the root of life line. it also touch the life line. and at the bottom of the line having a Conch Sign(Shank Sign). definitely i am sure about this sign. if so i could submit picture of my palm. please kindly tell me the signs and lines what tells about my future. Damitha, the marriage lines are one of the most unreliable lines on the palm and therefore I avoid reading them. However if you go by what traditional palmists say then you have nothing to worry because two lines joining into one shows a good and happy union. I am assuming of course that you are referring to the lines on the edge of the palm. As to what you mentioned about the fateline, this is an area I cannot comment unless I see the hand because a lot of the time other lines are mistaken for fatelines. I need to be sure that it is indeed the fateline that you are referring to. If you are interested in getting your hand read, please write to me at blog(dot)nita(at)gmail. (dot) com and I will let you know the charges and the time period when I will be able to deliver the hand reading if you choose to take it. thank you for the quick reply. i understand your explanation. i will submit my palm images to you. then you can see the things correct or wrong. thank you very much. Have been undergoing the treatment for breast cancer for the last two months and am naturally anxious about how life goes on from here for me. Keep looking at my life line and keep thinking , reading the posts and your replies , am wondering , do life lines really change as per our attitude? Of course they do Ritu! Why, just a few days ago a person whose hand I read three years ago has come back to me with a completely changed future!! I have also seen lines change in the hands of people I know. However the focus should not be on the lines. It should be on yourself. The lines change only if there is a significant change in the personality and lifestyle. Life lines can strengthen, and develop supporting lines. Not everyone's lines change. It requires considerable motivation and will power to change one's life. By willpower do you mean that will power which is presently visible on his palm? In that case the person having very less will power would not be able to change for good ? Or would his willpower would also improve because of his deep desire to change? A person will less will power will find it more difficult, but not impossible. Motivation is the key factor. Without motivation even a person with great will power can get into bad habits. With motivation a person with a weak will can develop all good traits, like concentration, will power etc. I am a 22 year old girl who has been through a lot of emotional turmoil in her teens specially relationships be it with family or others. I stood strong after it all went and created an another self of me. Last year somehow I regressed in my teens because of a similar incident aroused fear in me. I am trying to get through all this but I am not so strong right now and currently my state of mind says that I could not take anymore turmoils. I am fearful of the future and astrology made it worse somehow. People at times have told that I will have two marriages and will create trouble for my spouse. I am right handed girl with a single deep line which ends in fork just in between the heart and little finger and two comparatively faint and short lines below and above it. My left hand has 2 deep marriage lines in which the upper ends in a fork. I am having a relationship but since the fear aroused inside it all went to worse atleast from my side. Please guide me. And if anyone tells you that your future is fixed, whether in numerology, astrology or palmistry, they are conning you. If you are fearful it is likely because of insecurities in your personality. Please aim towards a calm mind, either through mediation. yoga etc. Thank You so much for your advise, It means a lot..:). I will remember what you said and will towards it. NIta madam I have a question I have been searching to find answer for .Im studying Msc ( chem) and I loved a girl for 6 years . she left me due to various reasons and I want her back more than anything. I went to 100s ( not exaggerating ) of astrologers and most of them said the same thing that its gonna be tough but possible . my question is assuming the lines in the palms are legit and gives correct predictions . Is not there any way to avoid them? i mean if a marriage line ends with fork , means the break up is eminent ( im just using marriage line as an example , though i know you said its the least reliable line) , but jotishis say that if this or that are done the problems will be cleared . then will my pam lines change too ? i mean I will be the same guy with the same lines but with a different future? thats not possible , is it? and is there something called destiny ? ex-if i were to get a girl named X , why do tantra mantra and stones and remedies to get her? .and if I finally get her , what was that which said me " i cant get her unless i do this and that.."
is there anything fixed ? or everything can be altered ? Of course you can change your lines and your future, but if you yourself change. Tantra, mantras, stones etc will make no difference. Your destiny is in your hands. Character is destiny. That said, you cannot control other human beings, least of all who they want to be with. Therefore if the person you desire has chosen to be without you, then you can do nothing. The more you try to get her, the more difficult it will be to get her. Don't let it become an obsession. Let her go. She left you for some reason. It is her right. Respect that. That is what change means. You can change yourself. Not her. By moving on with your life, you will get happiness. And no one can predict whether you will get her or not. That cannot be seen by any astrologer or palmist. Hi Gunjan. Firstly, the absence of a fateline does not necessarily mean a problem. There are people who have good jobs at the time when there is no fateline present. It may mean some type of dissatisfaction during that time, but the cause cannot be determined by your description. Sometimes other lines can also conpensate for the fateline. Usually there is some reason why the fateline is not present. It can show something in the temperament. Secondly, please don't assume that the line won't change. I know someone whose fateline grew more than an inch in a space of six months. And he was more than 45 years old. The younger you are, the more the likelihood of the line changing. However if you have mentioned any of this stuff to your young, impressionable brother, it could have an adverse effect and become a self fulfilling prophecy. Nikhil, there are people who have jobs and stil the fateline is absent. That said, the most important thing to remember is that the fateline has nothing to do with luck. It is connected to personality characteristics. People who concentrate on one goal, have a strong purpose in life, and are hardworking and serious usually have good fatelines. Also, the fateline is one of the lines which changes most easily...therefore I suggest you concentrate on developing your talents and your personality and forget about the fateline. I do not need read hands by descriptions akion. And I could tell you the meaning of a sign on your hand, but if you want the whole hand read it is a different matter. If you are interested in a paid reading please let me know. Ma'am I have a Hexagram(Star of David) on my Neptune Mount . I don't see much literature on it on web.Can you guide me on what does it stands for? Is it possible for you to read my palm. If I send current picture. Not sure on how to determine that which of my hand is dominant as I use both of my hands for multiple tasks. Yes information about the difficult and good periods can be seen from the hand. Please write to me at blog(dot)nita(at)gmail(dot)com and I will let you know the different types of readings available and the charges for them. I am not aware of any line called the "inheritance" line. Even if you believe that some line on the hand is called this, what is also quite certain that the hand cannot reveal whether you will get an inheritance. Palmistry is a reflection of your brain, both conscious and sub conscious. The hand has a plethora of nerves, directly connected to our brain. Palmistry is not superstition and nor is it fortune telling. It is an invaluable tool to help us understand ourselves. If you go through all the written articles on this website under the label palmistry you will get an idea. Hello King. As both men and women belong to the same species, there is no hand difference when it comes to reading. Secondly, a short lifeline does not mean a short life. There are umpteen cases of people with long lifelines having a short life and cases of people with short lifelines having a long life. And if your right hand is different from the left hand, it is quite normal. The hand you write with, whether left of right, is your current personality and the passive hand is the inherited and past. You will find articles on life and death, and symbols and signs. The lifeline on my left palm has been itching since a week. What does it mean? I have a broken life (fate) line. The itch is coming from the point where my life line breaks up into grids. What does it mean my age?? Rukmini, the hand you write with is your active hand. Also lifeline being forked is not a bad sign at all, and a short lifeline does not indicate early death. If you are worried you can write to me to the email address provided on this blog. It is on the right hand side column. I have a fork on both sides of my marriage line, what that imples? one palmist said that I will have troubles in getting married & if I do then it will end in a divorce, another one said me & my husband will live in different countries after marriage. I dont know what is true. That palmist who told me that my marriage will end up in a divorce told me a remedy that if I get into a reltionship with someone & then break it then I can avoid divorce & the fork in my hand. But I dont wanna do this remedy as its next to impossible for me. Can you tell me what fork on both edges means? What is grill actually like.what if it is on sun mount. What is grill sign.n what if below sun mount. What is d significance of signs below mounts. Signs like grills cannot be read in isolation. The whole hand has to be seen. Mam why when people go to net and mostly get dreadful things written to make them anxious in palmistry. Why not palmistry have more positive things to motivate people. And no to less negative things. It's a known truth that everyone gets motivated by hearing good things about them n gets worried by listening bad. For if someone is said he will do something wrong den from that day he will start thinking what wrong will he do.n might end up doing wrong. What i want to ask is why posts on palmistry are more negative making people worried. Plz ans me mam. Palmistry is not full of negative things. People are. I have nothing to say about the negativity because if anyone wants to read and believe the negative things, then it is on them. If you are reading my website you will know my way of working is not like that. There are two or three lines below sun mount I think sun line as they are perpendicular.and two or three slanting lines cutting the perpendicular lines .can this be called grill.made from sun lines .I have seen this kind in some more hands. Cross lines on the sun line are common. But unless I see it I cannot say anything about it being a grill. In any case the seriousness of the so-called grill depends on the depth of the sun line, the depth of the horizontal lines cutting it, the quality of the fate line, head line and heart line at around the same time line. Mam are you getting my mails. I m not getting any reply from you. I have replied to three of your emails, which you sent one after another. I also replied to all your comments on this website. Then you sent me an email again today around 11 a.m. I was out the whole day and again got several emails and comments from you. The first email was a question, the others were why am I not answering. Then I saw you had left 3 comments saying why am I not replying to your emails. This is harassment. I am sorry, please do not expect a reply from me within a few hours of writing. I usually reply within 24 hours. In your case as I have already answered your comments and emails a few days ago, this time you will have to wait, as I am busy. Sorry Mam. U used to reply very fast so I thought u are not getting my mails.ok mam I can wait. Hi Akion. The Sun Line cutting the Sun line is very rare, and I have to see it, to see its quality and shape before giving you an answer. Regarding rectangles, they are usually just chance lines. Should I sent you my palm pic?How can i sent?Can you just check only that particular line for free? Send it to my email id at blog(dot)nita(at)gmail(dot)com. This email id is given to the right of this website on the sidebar, if you are viewing from a computer. And no, I will not charge you for this. I will tell you if it is really cutting it or not, and if it is really cutting the sunline, what it means.